Fall 2007. Make-Up For Ever. Purples, lots of eggplants and lilacs. I have a soft spot for Make-Up Forever… I find their stardust powders (especially the gold) to be irriplaceable and the Liquid Lift Foundation (in number 2) to be one of the best foundations I have ever put on my mug. So, it’s no surprise that their Fall 2007 line is bold and brilliant. I had the pleasure of trying the diamond eyeshadow in 311 – a burgandy mauve with copper shimmer, and the Aqua Creamliner in 5, a deep plum hue. Together, they look super powerful. The great thing about Make-Up Forever products is that you put them on in the morning and they stay put through out the day. If bold is what you’re looking for, look no further. 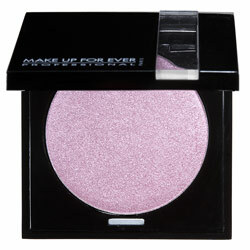 Make-Up Forever has again suceeded in creating powerful make-up that transcends beauty!